Honey yeast rolls with maple butter: Impossibly soft and incredibly delicious pull apart rolls with a hint of sweetness from a quick homemade maple butter. Since we started hosting holiday dinners a few years ago, there has always been one aspect of dinner that has baffled me. It’s not the turkey, stuffing, or lord knows, not the dessert. See, I made these honey yeast rolls six years ago, brought them to my mother-in-law’s house, and I haven’t been able to replicate them since. I’ve attempted that recipe probably three or four more times in the interim years and with each try, I became increasingly impatient and frustrated. I turned to another [and most delicious] recipe for a while with great success. But I haven’t been able to shake those honey yeast rolls from my brain. I suppose it was only natural that my brilliant and highly persistent friend, Annie, after introducing me to this recipe the first time around, would tweak this recipe over the years to the point where it’s truly perfect now. I added the maple butter to the recipe and these honey yeast rolls with maple butter make me swoon. They’re impossibly soft and incredibly delicious. The maple butter isn’t a requirement for greatness but why the heck wouldn’t you slather them not once, but twice with it? Because the maple butter adds some extra sweetness, I’d recommend serving the rolls with distinctively savory food. Might I suggest roast turkey roulade with sausage, fig, and cranberry stuffing? Or perhaps caramelized onion and thyme risotto? Or maybe even flat roast chicken with tiny potatoes? You get the point. 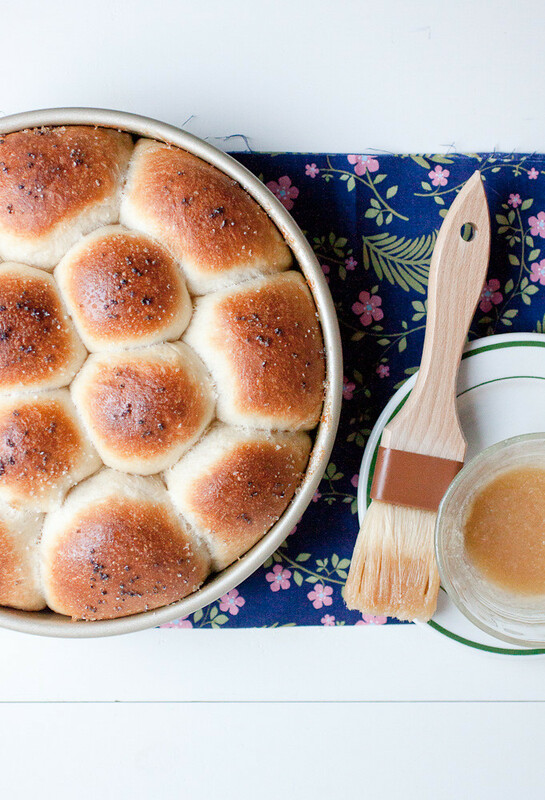 Now, just go ahead and make these honey yeast rolls with maple butter. You won’t be sorry! The dough for these honey yeast rolls is very wet and sticky. It is not conducive to making without a stand mixer because it will be incredibly difficult to pull together the dough together to knead on the counter top. 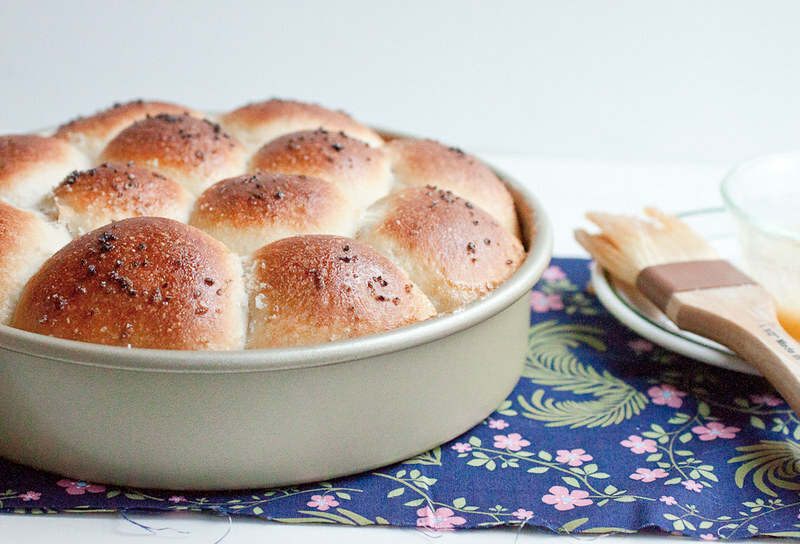 Unfortunately, I do not have a bread machine so I can’t attest to how this recipe would turn out by using one. If you try this method though, please come back to let me know how the rolls turn out. Stir the yeast and water together in the bowl of a stand mixer fitted with the paddle attachment. Stir in the honey, oil, salt, and egg on medium speed until well-combined. Add 3 cups of flour to the bowl and mix on low speed until the dough forms a wet and shaggy mass. Switch to the dough hook and with the mixer on low speed, add up to another ½ cup of flour a couple tablespoons at a time. Continue to knead for another 8 minutes, until the dough is smooth and elastic. Transfer the dough to a lightly oiled bowl, cover the bowl tightly with plastic wrap, and allow the dough to proof in a warm space until doubled in size, about 2 hours. Lightly grease a 9- or 10-inch round baking or pie dish. On a well-floured work surface, knead the dough for 30 seconds. Shape it into a ball and let rest, covered with a clean kitchen towel, for 10 minutes. Punch the down the dough, divide it into 10 or 12 equal-sized pieces (a kitchen scale works great for this) and arrange them in the prepared baking dish, leaving a little space between each one. Cover again with the kitchen towel and allow the dough to rise for 20-30 minutes. The rolls will puff slightly but will not double. Meanwhile, preheat the oven to 400° F. Melt the butter and stir in the maple syrup until evenly combined. Brush the melted maple butter over the tops of the rolls and sprinkle the rolls lightly with a little sea salt. Bake for 15-20 minutes, until the tops are golden brown. Lay a piece of foil lightly over the rolls and continue to bake for another 10 minutes. The center of the rolls should register 190° F on an instant read thermometer. It’s critical to check the temperature because the tops of the rolls may look like the rolls are cooked through, when in fact they are not. Note that the salt may brown a bit – the sugar in the maple syrup will cause this to happen but this will not affect the flavor. Transfer the pan to a wire rack and brush the rolls again with the remainder of the melted maple butter. 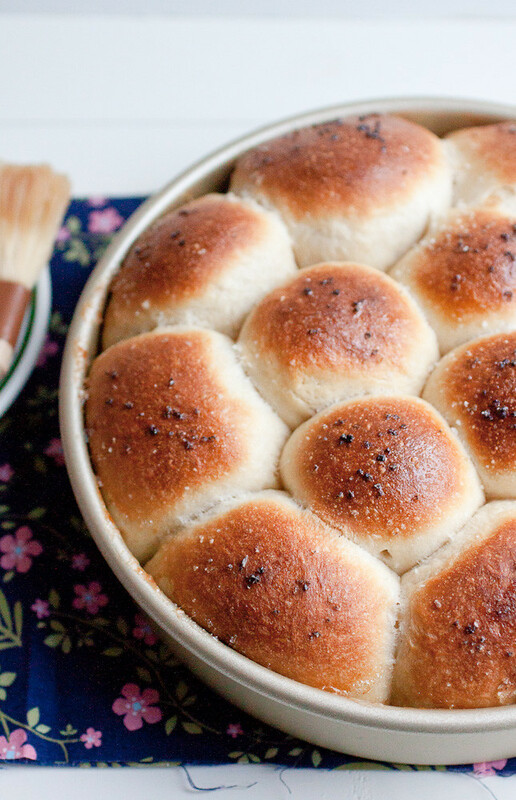 Allow the rolls to cool for 5 minutes before serving. Thanks, Kayle! They were even more stunning as I stuffed them in my mouth all warm from the oven. ha!